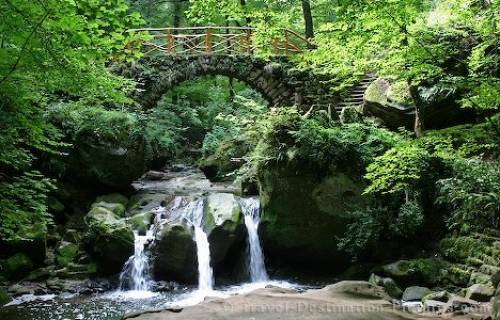 In the Muellerthal near Echternach the beautiful bridge is situated over the little creek called "Schwarze Ernz". This little waterfall has a special name "Schiessentuempel". Located near a touristic parking place one can take hours only photographing this bridge from different angles and positions - and waiting for the absence of tourists on that bridge. Surely not a must when visiting Europe but it is worth visiting when you are travelling nearby. Picture of the pretty stone bridge over the Schwarze Ernz near Echternach in Luxembourg, Europe.